It’s said a picture is worth a thousand words, but I suppose that depends on the picture. This one requires some explanation and I can’t guarantee I’ll do it well. But I’ll try. 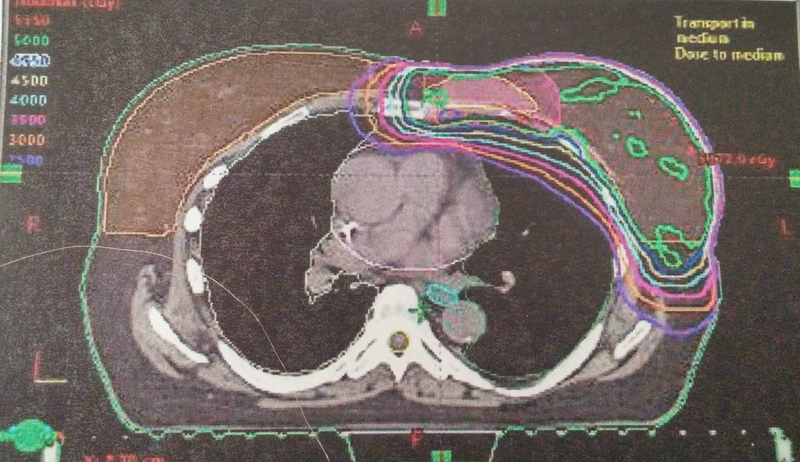 This is a cross section of a scan of my chest. (Actually, it’s a photo of a very small printout of the computer screen I was looking at this afternoon, hence the poor quality.) Left and right are reversed because the view is from below, looking up. Long story short, the colored contour lines mark areas to be radiated. (Remember, this is IMRT*, or intensity-modulated radiation therapy.) Note the lines skim around my heart, the gray blob right in the middle. Hurray! That’s the big story here. The doctor said they had to run a lot of calculations to come up with this, and I am deeply appreciative. I was unlucky enough to get a tumor practically in the middle of my chest, where it didn’t show on a mammogram and, once discovered, has been difficult to treat. But I’m lucky to have a heart that’s located almost exactly in the center of my chest, which allowed the radiologists to work around it. Had it been farther to the left (right in this image), as it is in most people, it would have been difficult, if not impossible, to treat me without damaging it. As it is, you can see the radiation does clip a part of the left lung. Unavoidable, since the lungs fill the entire chest cavity. At this point I’m not sure what the long term effect on the lung will be. Today it was enough for me to see that my heart is in the clear. The center of all the contouring is a pinkish area within a yellow contour (below, A). That’s where the tumor was. The tiny blue circle (B) under (behind) the left end of that area is the vertical chain of internal mammary nodes, several of which appeared cancerous on early scans. The total area being radiated extends all the way from the side of my ribs over to the right side of the sternum. And up to above my collarbone (there are lymph nodes there, too). Big area. Trying not to think too much about it. I found this diagram on the internet, and with the exception of the arc/corner over the arm, it shows where I’m being zapped. With at least two applications of lotion a day, it looks like I’ll be going through gallons between now and mid-November. By the way, you’re excused if you didn’t read this far. This stuff is definitely an acquired taste. I find this technology interesting. I was glad to read a few weeks ago that one of the two hospitals here in little old Joplin now has its own linear accelerator. The article said that the door to the guts of the thing weighs 48,000 lbs! It’s all fascinating stuff. I keep asking the techs “What’s this?” and “What does that do?” And all the different scans fascinate me. When you and I were kids, x-ray was it. Now we’ve got CT, MRI, PET, and PET-CT. And instead of films on lightboxes, we “fly” through 3-D images on computer screens. And of course I’m especially grateful for the IMRT technology. Just a few years ago they’d have been zapping me with straight, full-strength lines of radiation, either doing lots of collateral damage or simply foregoing radiation altogether. Walking down the hall, I think I’ve counted doors to five linear accelerators here. It’s all very science fiction-y, but aren’t we glad the future is here! I’ve worried for months about how radiation was going to affect my heart and whether or not they’d be able to avoid it, given the cancer location. I love technology! I read the whole thing. Thank you for sharing this. It’s a very personal thing, when you stop to think about it. We can see the inside of your body! Where the tumor WAS. Past tense. I know you still have a lot of treatment ahead, but that “was” felt good to read. Technology is indeed wonderful, and so are you, my friend. Aw, thanks. Yes, the “was” makes a BIG difference. And now I can look back and see how far I’ve come since that tumor became history on June 23. It buoys me no end, especially on those days that aren’t quite so bright.